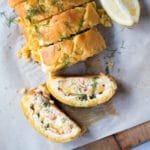 Gluten Free & Keto Smoked Salmon & Ricotta Pastry Roll-Up ? 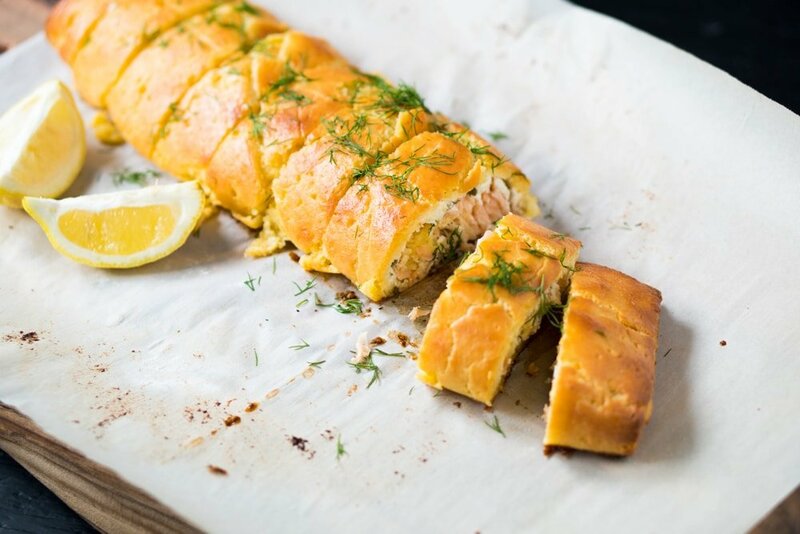 Smoked Salmon & Ricotta Pastry Roll-Up ? Call them roll-ups, pinwheels or what-not. 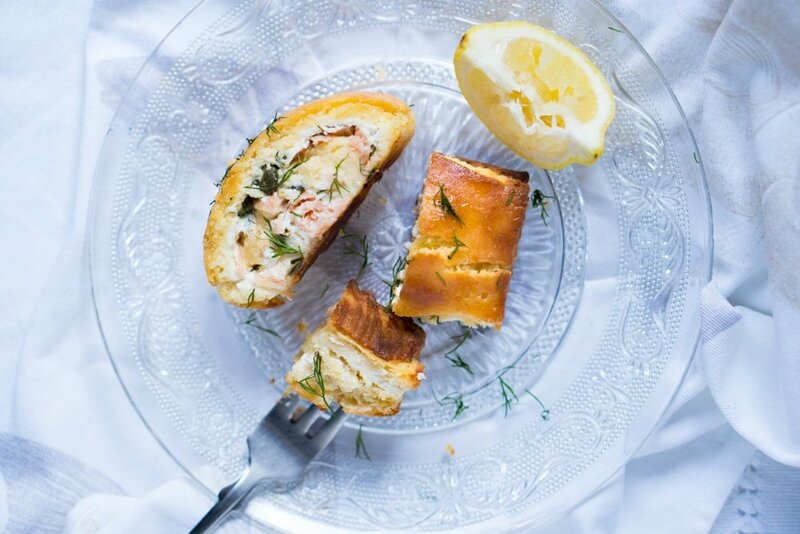 But these gluten free and keto smoked salmon and ricotta pastries are truly exquisite. And note, that we don’t take that word lightly. Take a flakey and super tasty keto pastry dough. Yup, we said keto! 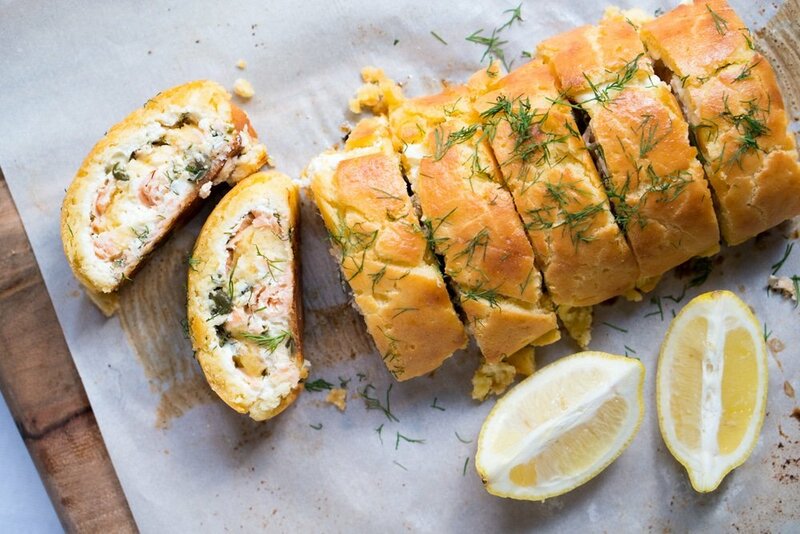 And roll it up with smoked salmon, lemony ricotta, capers and dill. It really is a must. We like a mixture of super fine almond flour and coconut flour best. Add a touch of xanthan gum, and we’re golden. And don’t be afraid of the seemingly long list of ingredients, as you’re likely to have most in your cupboard/fridge already. ?? You must chill your pastry for 1 hour (at least) before using it. Similar to your good-old wheat flour, the almond and coconut (in particular) need the time to soak up the moisture evenly. So chill for one hour, and up to 3 days. Note also, that we find it much more mess-free to cut it up after baking (i.e. no oozing ricotta or salmon!). But if you are looking for a more pinwheel shape, go for it pre-baking. Just make sure you use a super sharp knife. Oh and for those of you on keto, did we mention 3g net carb per roll-up? It’s one killer (and quite filling, matter-of-fact) entree. Add almond flour, coconut flour, xanthan gum, salt and lemon zest to food processor and pulse until evenly combined. Add butter and cream cheese and pulse for just a few seconds until crumbly. Add in egg and vinegar and pulse until the dough just begins to come together (but stop before it forms into a ball). Turn out the dough onto cling film and form into a round. Refrigerate for at least one hour, or up to 3 days. Mix ricotta, olive oil, lemon zest, lemon juice in a small bowl and season with salt to taste. Set aside. Roll out pastry dough in between two sheets of parchment paper, lightly dusting with coconut flour as needed. Trim the edges with a pastry wheel or knife (and make some small crackers out of it!). 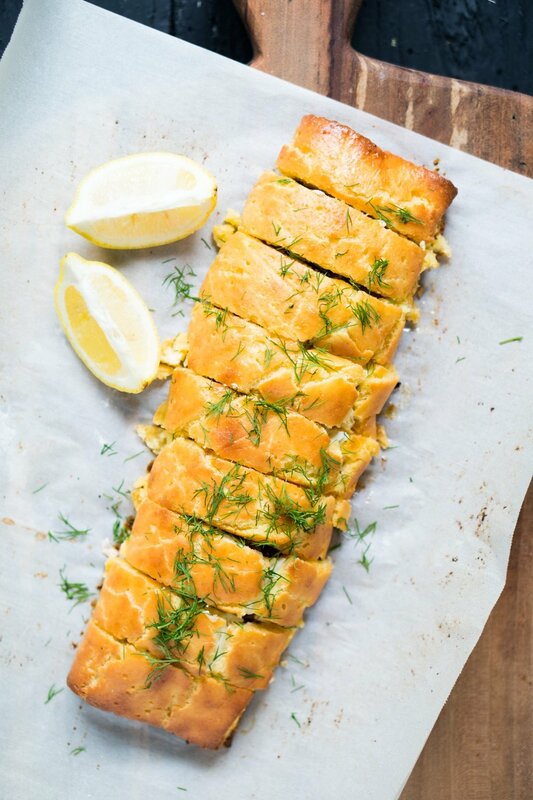 Spread a layer of lemon ricotta on the pastry, sprinkle with capers and dill, and add a layer of smoked salmon. Roll up the pastry, using the parchment paper as an aid. Remember that gluten free doughs are much more fragile, so you do need the aid of parchment or wax paper here. Brush with egg wash and transfer to a baking tray. Bake for 27-30 minutes, until golden all over. Allow to cool for 10 minutes before cutting, and serve with lemon wedges. Wow, wow, wow – I am AMAZED by this dish! I knew from reading the recipe these flavors would work well together, but I still couldn’t have anticipated just how tasty it turned out! 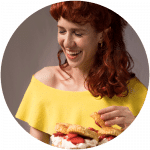 And that pastry dough is exceptional – incredibly similar to the real thing, there is literally no other keto pie dough/crust I have come across that even compares to this one!! And FYI for anyone wondering, I reheated some of this roll for breakfast this morning and it reheats beautifully. Make this dish! 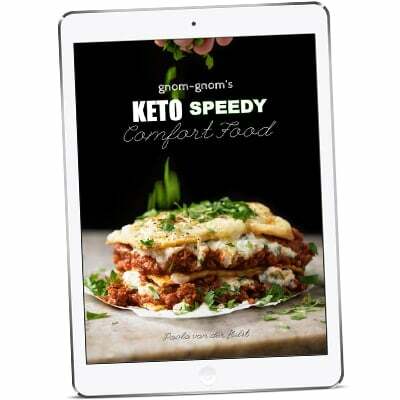 I made this recipe yesterday for a birthday party for non keto people and all of them liked this recipe very much, it is very yummy! And not difficult also, a very good pastry recipe also. I like your recipes very much, thank you for posting them. Greetings from Belgium, Ann! Does these roll ups be rewarmed? Can they be made the day before? Excellent! I allowed the dough to rest for two days and it turned out perfect. I can see making other types of roll ups. Thank you! Can you use fresh salmon? The results will be different (think salmon wellington!) but I don’t see why not ;)! This looks amazing! I’m making it for a cocktail party…serve warm or cold? Thank you! Just adore your blog! So happy to hear that Hannah! You can serve it either lightly warm or at room temp (not cold), it works well both ways 😉 xo! So I suppose that this review is for the pastry crust! I was going to have ground beef keto tacos for lunch, saw this in fb and figured why not? And boy am I glad I did!! Tastes great and was really easy to make. Ill def be trying this with the fam! Thank you!